Opening Memorial Day Weekend at Six Flags Over Texas’ GOTHAM CITY: Three NEW thrilling attractions! The Riddler Revenge: A 90-foot pendulum that propels you back and forth on a dizzying, 70-mile-per-hour counter-clockwise journey. Not for the faint of heart! Catwoman Whip: The Catwoman Whip offers the chance to spin, tilt and whip around, building up speed and more speed until you can’t wipe the smile off your face. Harley Quinn Spinsanity: A classically-styled 30-foot spinning ride, Spinsanity offers “just-right” thrills for adults and kids of all ages, making it the perfect ride for the entire family. ONE: So whose big idea was all this, anyway? 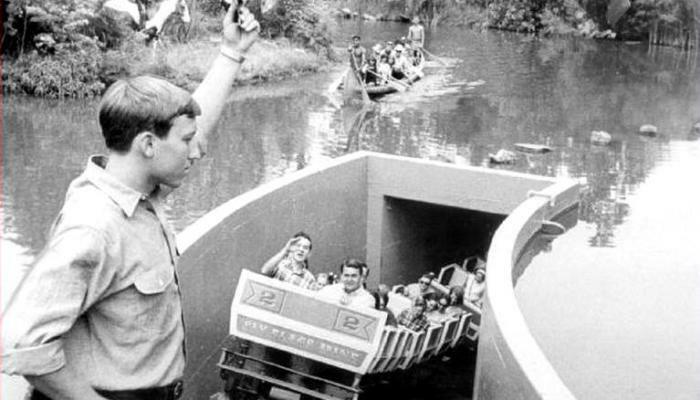 Six Flags Over Texas was the combined brainchild of former Arlington mayor Tom Vandergriff and local entrepreneur Angus Wynne, Jr., the park’s original owner and developer. It took Wynne about $10 million and one year to complete construction on what he originally intended as a “placeholder” project that would eventually be converted into an industrial complex—a plan that quickly faded as the park’s popularity took root. Vandergriff and Wynne’s vision for a Disneyland-inspired, deluxe-but-affordable destination for family entertainment would forever change Arlington and Texas history—and ultimately expand into what is today the world’s largest amusement park company, with 18 properties in North America and two located overseas. TWO: Take a ride down memory lane. Indulge in a bit of nostalgia on your next visit to Six Flags by taking a few of the park’s more “historical” rides and attractions, including the Oil Derrick (open since 1968), Runaway Mine Train (1966), El Sombrero (1965), Yosemite Sam’s Gold River Adventure (opened in 1964 as the Spee-Lunker’s Cave), Silver Star Carousel (1963), El Aserradero/The Log Ride (1963), and the Chaparral Antique Cars (1962). Which Six Flags ride weighs in as the oldest still in existence, you ask? That would be The Six Flags Railroad (located at the Texas Depot), which has been in operation since the park’s inaugural season in 1961. THREE: What’s the story behind those six flags? The park’s name famously refers to the flags of the six different nations that have governed Texas since the 1600s, from colonization to the modern era. Originally, the park was correspondingly divided into six regions representing these unique eras of Texas history, with a heavy focus on our state’s Hispanic and Old West heritages. Some of the Six Flags’ most popular rides and attractions from the Texas history days were Casa Magnetica (which actually re-opened in the 2000s), La Salle’s Riverboat Expedition, Spee-Lunker’s Cave, Skull Island, The Texas Chute Out, and Spindletop, as well as the Southern Palace and Crazy Horse Saloon (which are live music venues still in operation today, along with the “living history” rides mentioned above). More Six Flags by the numbers: The park is laid out over 212 acres and features more than 150,000 flowers and plants, as well as several miles of lush hedges. And lastly: Annually, it takes more than 4,000 Six Flags “hosts and hostesses,” the park’s most visible staff members, to maintain smooth operations and to make sure your visit is both safe and fun. Home to the world’s first log flume (El Aserradero), the world’s first parachute drop ride (The Texas Chute Out), the world’s highest drop tower (Tower of Power), and the world’s tallest swing ride (the Texas Sky Screamer). In 2015, the park premiered a new 4-D “dark ride,” JUSTICE LEAGUE: Battle for Metropolis. In 2016, in addition to adding three new rides to Gotham City, Six Flags also welcomed The New Revolution Virtual Reality Roller Coaster. Pay attention to those hosts, hostesses and performers, because you just might say “I knew them when” someday. Celebrity Six Flags alumni include Grammy winner/American Idol Kelly Clarkson, Broadway legend Betty Buckley, singer-songwriter John Denver, and New York Times best-selling novelist Sandra Brown. SEVEN: Six Flags is full of mystery and legends. For decades, local lore has maintained that Six Flags is home to a number of (mostly) fun-loving ghosts—including Annie, the spirit of a turn-of-the-19th-century Arlington girl who allegedly lurks near the Texas Giant, the railway tracks and the music venues. Among other harmless acts of mischief, Annie has been known to unlock doors, pull curtains and mess with the lights. Have you ever spotted her? EIGHT: The Pink Thing is an important part of Six Flags history. Ah, Pink Things. The frozen-treat-on-a-stick originally made its appearance at Six Flags Over Texas in the 1960s as “Pink Buried Treasure.” It was named as such because the plastic stick contained a charm-like figurine that was revealed once you got near the end of the treat. Over the years, these leftover became collectibles for Six Flags enthusiasts.